In collaboration with NASA, we mounted an observation campaign for the OSIRIS-REx spacecraft Earth Gravity Assist manoeuvre over Australia on the night of Sept 22 (and into the wee hours of Sept 23). 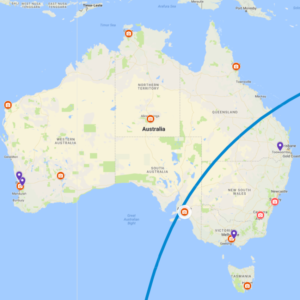 Our team were stationed across Australia and New Zealand in strategic locations to optimise viewing angles of OSIRIS-REx, creating a 3D triangulated track above Australia, and demonstrating the capabilities of the Desert Fireball Network system. The result? Our cameras imaged the 2.5m spacecraft from a distance of 60,000km! Why IS the DESERT FIREBALL NETWORK INVOLVED and where will the they be? The Desert Fireball Network has three separate goals for tracking the spacecraft: providing a baseline so NASA can compare its telemetry from the spacecraft with the team’s ground observations, testing the team’s equipment and orbital analysis calculations, and engaging Australian astronomers and the broader community. The DFN and our partners in this OREx Observation adventure are spread right across Australia. This map is just an approximate of where we may be heading – who knows where the best viewing conditions will be on the night! If you are keen to take part, head out of town to make the most of dark skies and a clear night. 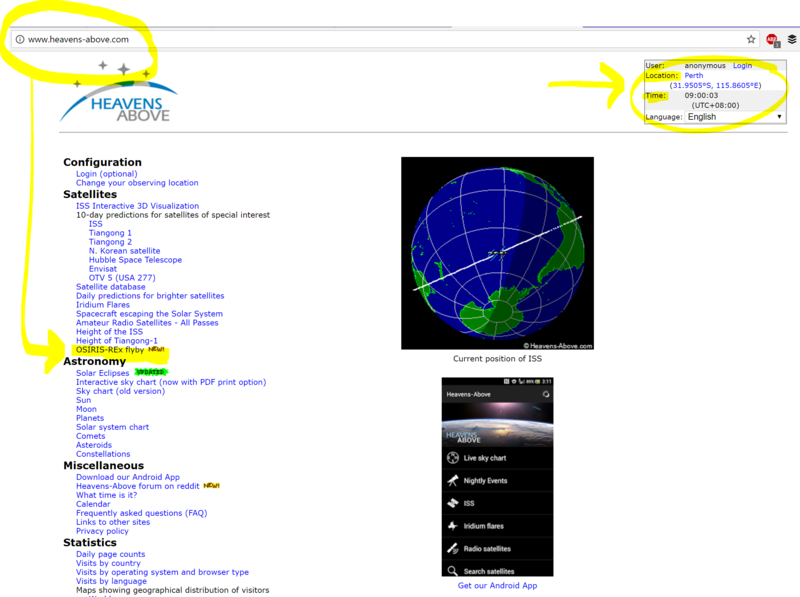 Visit www.heavens-above.com/OsirisFlyby and enter your location to find out when and where to point your lens to capture the spacecraft flyby! What is the NASA OSIRIS-REx Mission? The OSIRIS-REx spacecraft is traveling to Bennu, a carbonaceous asteroid whose regolith may record the earliest history of our solar system. Bennu may contain the molecular precursors to the origin of life and the Earth’s oceans. Bennu is also one of the most potentially hazardous asteroids, as it has a relatively high probability of impacting the Earth late in the 22nd century. OSIRIS-REx will determine Bennu’s physical and chemical properties, which will be critical to know in the event of an impact mitigation mission. Is there a Press Pack I can access? On Sept. 22, NASA’s OSIRIS-REx (Origins, Spectral Interpretation, Resource Identification, and Security – Regolith Explorer) spacecraft will make a close approach to Earth, using the planet’s gravity to slingshot itself toward the asteroid Bennu. 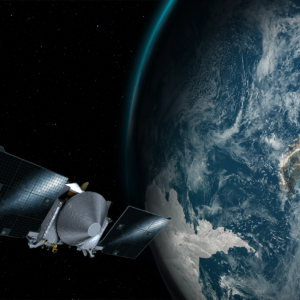 Over the course of several days, observatories and amateur astronomers with specialized equipment will be able to see OSIRIS-REx as the spacecraft approaches and retreats from its closest position over Earth, approximately 11,000 miles (17,000 km) above the planet’s surface. Banner Image: This artist’s concept shows the OSIRIS-REx spacecraft passing by Earth. Is there social media as well? Members of the public without telescopes can still celebrate the Earth Gravity Assist by joining NASA’s “Wave to OSIRIS-REx” social media campaign. Individuals and groups from anywhere in the world are encouraged to take photos of themselves waving to OSIRIS-REx, share them using the hashtag #HelloOSIRISRExand tag the mission account in their posts on Twitter (@OSIRISREx) or Instagram (@OSIRIS_REx). Or, if you’re keen like the DFN, you can download the Bennu 3D model and 3D print your own asteroid to sample with #MyOSIRISREx! 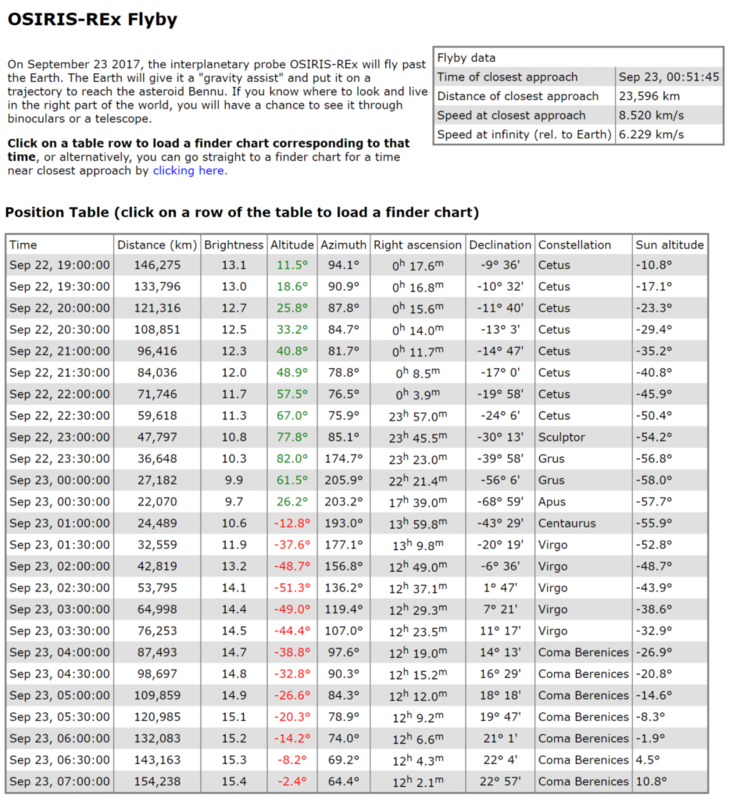 I'm an AMATEUR ASTRONOMER, WHAT DO I NEED TO KNOW? Got a telescope or high-end camera with a serious lens? Keen to catch a glimpse of this rare spacecraft slingshot? Available to head out to dark skies on the night of Sept 22 (and into the wee hours of Sept 23)? Then you can track OSIRIS-REx too, alongside the Desert Fireball Network across Australia. Any data and images you contribute will be acknowledged in this scientific endeavour of triangulating spacecraft with the DFN and NASA. The apparent pathway of the OSIRIS-REx spacecraft over Australian skies will take an hour, beginning over Rockhampton at 00.22am (AEST) and exit over Adelaide at 00.53am local time on September 23. The lateral motion of the spacecraft is expected to be small during Earth approach. Use the same exposure times that would be appropriate for a slow-moving asteroid. For some setups, this means 30 seconds or less. Start with “long” exposures and shorten if needed to reduce any smearing from the spacecraft motion and Earth’s rotation. Or, just take one very long exposure of the sky to capture OSIRIS-REx among star trails. The spacecraft will be moving much faster in the hours leading up to EGA so shorter exposures may be required. 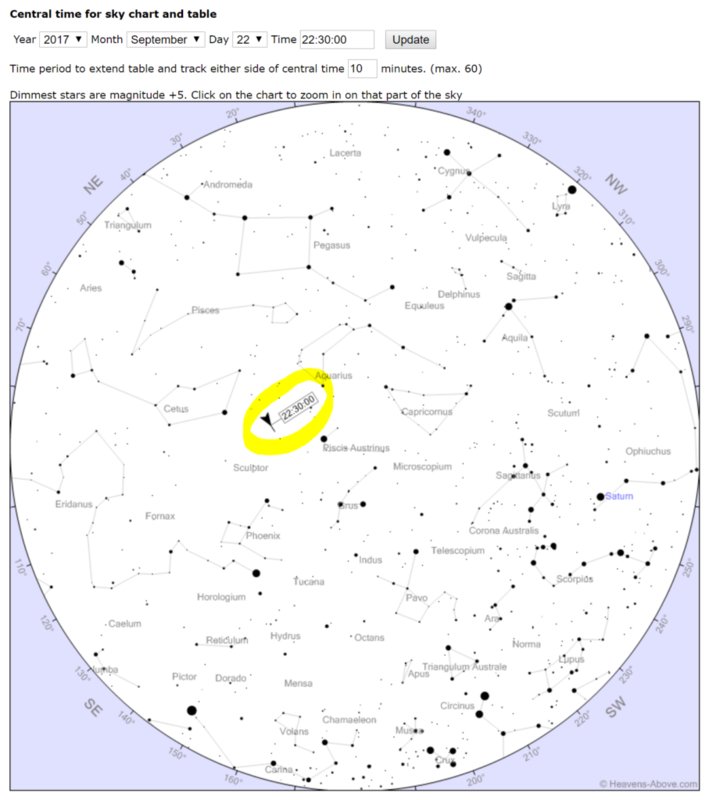 Thanks to Chris Peat from www.heavens-above.com, you can find out when OSIRIS-REx will be in your local sky and where to point your lens. Are there other Citizen Science projects? 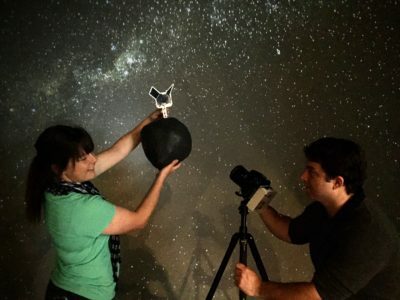 Join a citizen science project that contributes to our understanding of near-Earth asteroids.